Little Mrs. Married: Chicken Divan...a lighter version! I got this recipe from SkinnyTaste, and it is oh-so-good! I kid not. It is absolutely wonderful! I will type it here the way i did it, which is only slightly different from Gina's. You can check out the original recipe here. Bring a large pot of water to a boil. Add the broccoli and cook about 3 minutes (do not cook fully; they will continue to cook int he oven). Rinse with cold water to stop the cooking. Drain well and set aside. Preheat oven to 350°. Grease a 9 x 13 inch baking dish with cooking spray. Heat a medium skillet on medium heat. Add the butter and oil until melted and then add garlic and shallots. Sprinkle the flour and whisk until smooth. Stir in broth, milk and sherry and bring to a boil. Remove from heat and stir in half of the swiss cheese. Season to taste with salt and pepper. 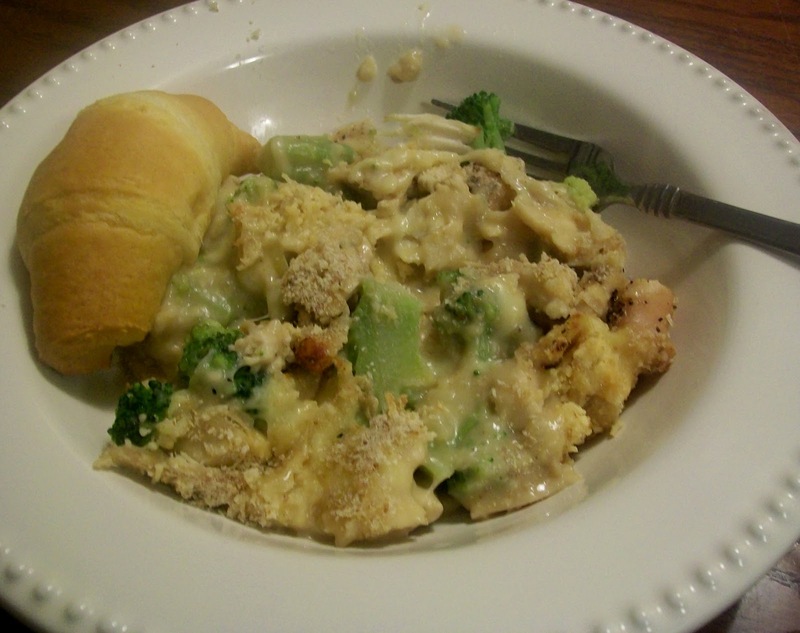 Arrange the broccoli in a casserole dish and pour half of the sauce over the broccoli. Arrange the chicken on top and cover with remaining sauce. Sprinkle the remaining swiss cheese, grated parmesan and top with breadcrumbs. Spray a little oil on top. Bake 30 minutes, serve hot. I saw this when she posted it and bookmarked it. I'm thinking I might try it with some of my leftover turkey. Thinking about it. Depends on what else I come up with for my menu this week. I saw this, too and I want to make it!